Coming later this month to Xbox Live Arcade and the PlayStation Network, Puddle is a fluid dynamics platformer that follows various fluids as they travel through a garden hose, a rocket engine, the human body, and more. Born from a project by six students from the French video game school ENJMIN and recipient of a Student Showcase prize at Independent Gaming Festival 2010, Puddle was picked up and developed by Neko Entertainment into a full Xbox Live Arcade / PlayStation Network title, complete with all the bells and whistles such status entails. Players will have to deal with different obstacles as well as the forces of gravity, friction, and other fun physics problems on the way to their ultimate goal. It's a game that lets players follow the path of a glass of water through the human body. I approve. 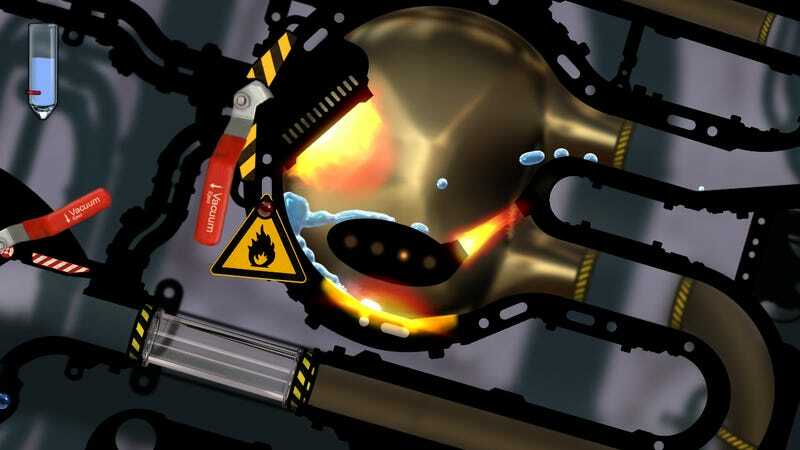 Konami is releasing Puddle on Xbox Live Arcade January 25, with the PSN version dripping out on January 31.